Engagement: Loving the Season of "In Between"
The other day I was looking at Dave and thinking about how great being engaged to him has been so far. This is such an exciting time. We are planning one of the most exciting days of our lives. Really learning and practicing how to work like a team. Having serious discussions about our lives. We are obviously not one of those couples who is rushing to the altar. When we got engaged we had been dating for 8 years, and we are in the middle of a 2 year engagement. 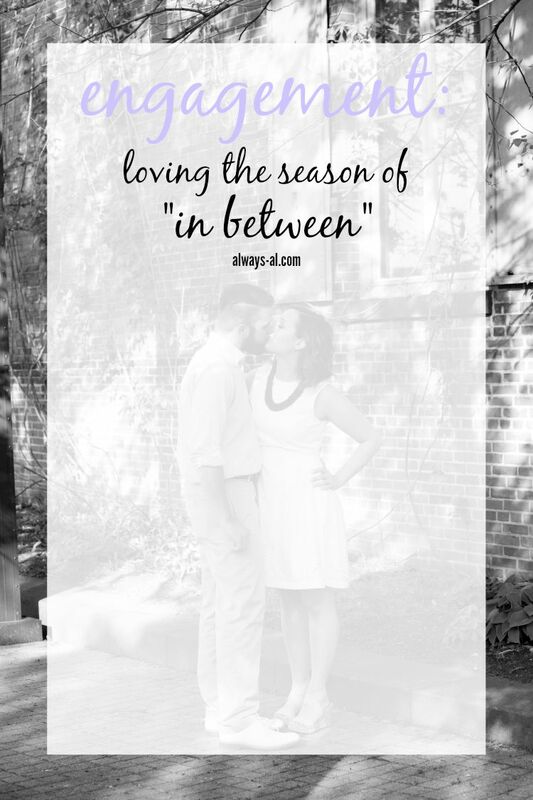 This season of "in between" has been one that we will both look back on with happiness. The season of engagement is one that is filled with so many emotions. Happiness and excitement about what is to come, and maybe some nervousness too. I don't know about you, but I'm only planning to get married once and I want to make this day special for me and Dave! Planning a wedding is tough. I dont even want to think about the fact that we are essentially just inviting 200 of our friends and family to a barn in the middle of the summer. I want to be magical, and there are so many details to consider. The other day I almost had a stroke about how much a shuttle bus cost. I am so glad that we chose to have a two year engagement. I don't want to spend the whole time as Dave's fiancée focused on personalized cocktail napkins. I want to keep the happy glow when I remember how he asked me to marry him. I want to continue to date eachother. I want to start to learn how to be his wife. Even though this is a season of in between, I for one am loving it. I love being a fiancée, and I can't wait to be a wife. **For some reason, blogger reverted this post back to draft mode on Wednesday night, causing all previous comments to be lost. The problem is now fixed, but I apologize for any confusion! !